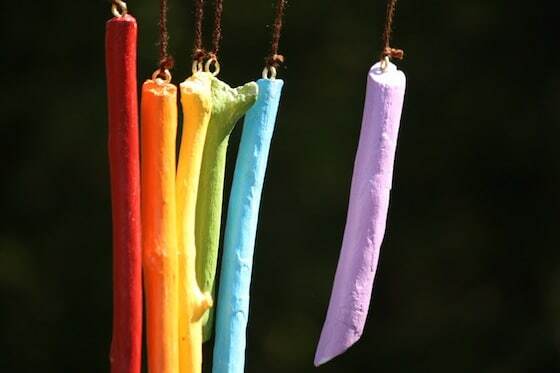 These homemade rainbow-coloured wind chimes made will add a splash of colour to any backyard or patio! 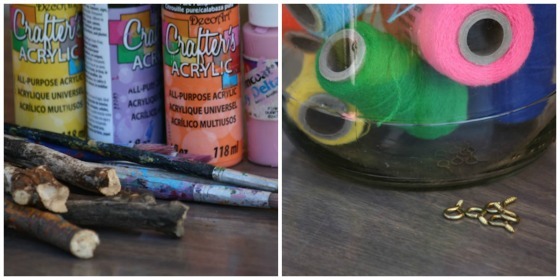 This is a fun and easy nature craft for kids to make for their own yard or to give as a gift to someone special! My list of Spring Craft Ideas is as long as my arm! 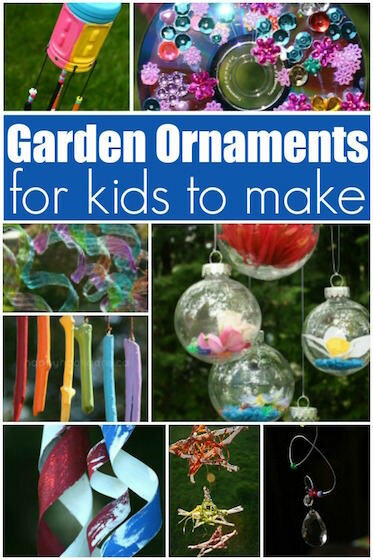 And making homemade wind chimes has been up there at the top of that list. Well, today, while we were out walking in the gorgeous spring weather, the hooligans just happened to start collecting sticks. And when we got home, it dawned on me that we could turn them into wind chimes. 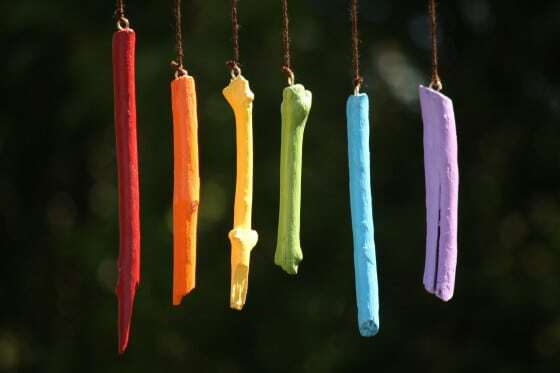 Not just any old wind chimes, but colourful rainbow wind chimes. 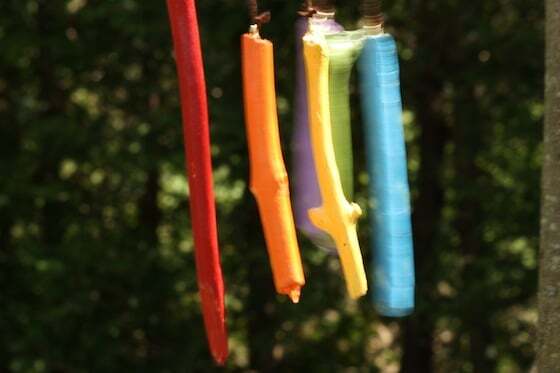 We just love making wind chimes here in my daycare. You can make the out of almost anything and they always look fantastic when you’re done. You can check out a collection of some of our favourites here. 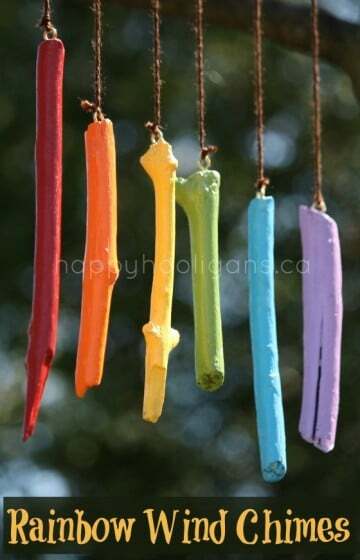 I was inspired to make these wind chimes the other day when I spotted this key wind chime over on Inner Child Giving. I loved how bright and cheerful it was, and how simple it was to make. I knew the kids would love making something similar to hang from the tree beside our playhouse. We started by snapping our sticks into lengths of about 8-10 inches. Next, we peeled the bark off the sticks. This is actually quite fun, and older kids might really get into this part. The hooligans are a bit young, and found it tedious after a few minutes, so I ended up doing this step mostly by myself. 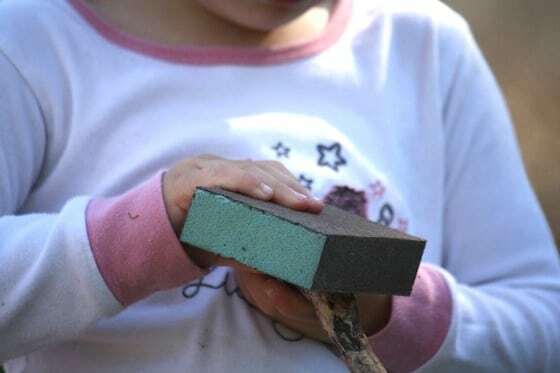 Then, everyone got a sanding block or a piece of sandpaper, and gave their sticks a quick once-over to remove any remaining bits of bark. The hooligans love sanding wood. For a fun activity, I sometimes set out a few pieces of scrap wood and some sanding blocks for the hooligans to have a go at. They think it’s great. They’re always impressed by how satiny the wood feels after giving it a good scrubbing. Then, each stick got 2 coats of acrylic paint. The sticks dried quickly in the sun, and then I brushed on a coat of craft varnish. This step is important for a couple of reasons. For starters, because these sticks will be hanging in the yard, the varnish will offer some protection from the elements. Secondly: a great craft looks even better with a coat of varnish. 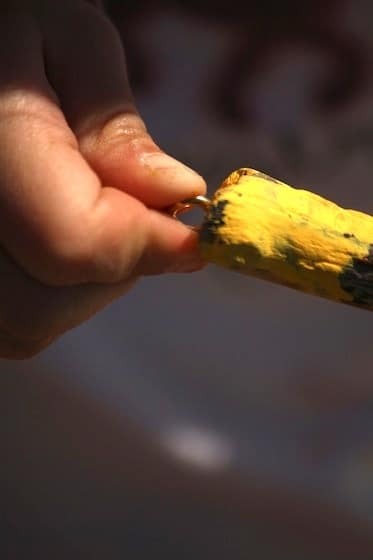 From paper mache to painted rocks, a coat of varnish will take your craft from “ok” to “WOW” in a matter of seconds. It adds some shine and makes your colours really “pop”. When the varnish was dry, we screwed tiny screw-eyes into one end of each stick. I started each one, and the hooligans finished twisting them in. 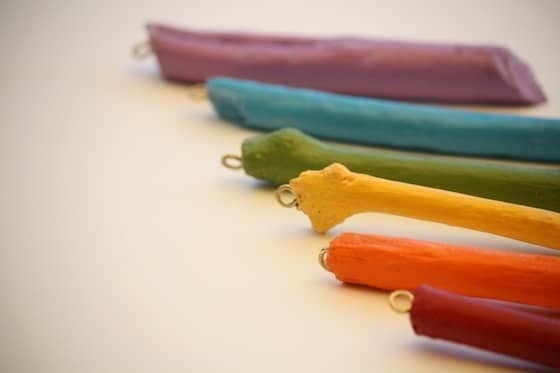 Depending on how hard your wood is, your child may require very little or a lot of assistance with this part. 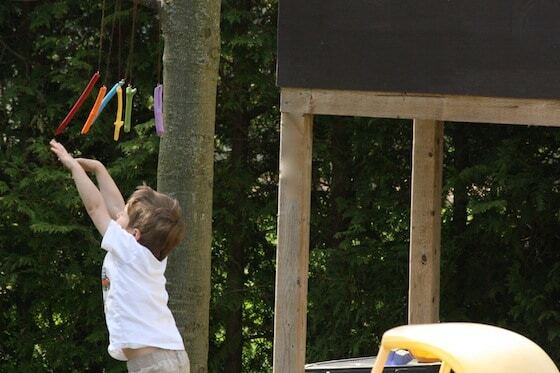 I then tied a long length of acrylic yarn to each hook, and took the sticks back to the oak tree beside our playhouse, and tied them to the lowest branch. Can you hear me doing my happy dance? Proof once again that you don’t have to spend a lot of money or get too fancy when it comes to crafting. Jackie this project is absolutely stunning and so playful. My son would love these wind chimes. I already picked out a place to hang them in our backyard. Can’t wait to make our own. Such a beautiful project, Jackie! 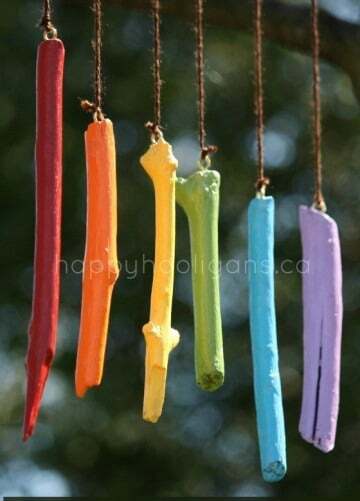 I’ve been thinking about different ways to make homemade wind chimes for a while now and this way is just beautiful! How awesome! We neeeeeed these in our yard, stat! Thanks for sharing! Ahh – that explains yesterday’s photo! 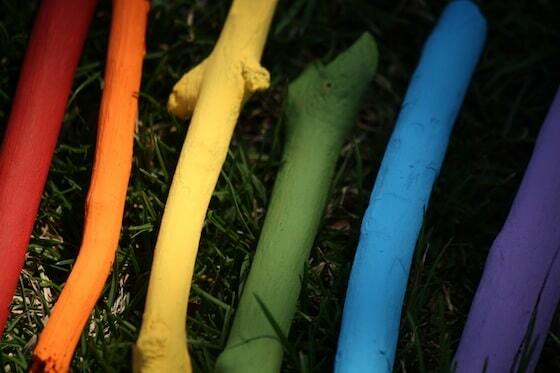 I was wondering what you’d do with painted sticks and you never disappoint! Beautiful! Glad you liked them, Erin! Thanks so much for sharing, Kimara. I’m glad you enjoyed it! Amazing Jackie! Those are gorgeous and fun no doubt. I love this! My kids will love this! It will be fun to see how the weather messes with this the longer it’s outside. They look lovely and fun! it’s an idea to put in practice. A wonderful idea. I really like this. We have so many sticks on the farm we could try this. So pretty. I love the rainbow color- gives some bright to outside even if it’s cloudy! My girls love hunting for things in nature and they love rainbows- ROY G BIV is talked about almost daily! Love the post. I love these! We just collected our sticks. We are going to add these to our end of the year teacher gift for my daughters kindergarten classroom. I thought I would have all the kids sign the sticks and present it to their teacher as a gift to her future students. Thanks for all the wonderful inspiration!! I just love these! Pinning! Hello, I’m featuring you tomorrow on the Outdoor Play Party. Sweet! Thank you so much, Hannah! I luv these. Very creative. Do they make a nice sound or just klunky sticks banging together? I love the sound of the bamboo chimes, I am sure they are not like that but just wondering! I think they sound nice. Kind of like bamboo, but they’re not hollow, so not quite the same. More than anything they’re a really vibrant visual accent in our playspace, and fun for the kids to knock together with a stick. I love the bright colours, they’d look lovely in my backyard. Thanks for linking up with Mummy Mondays. You’re welcome, Eva, and thank YOU! 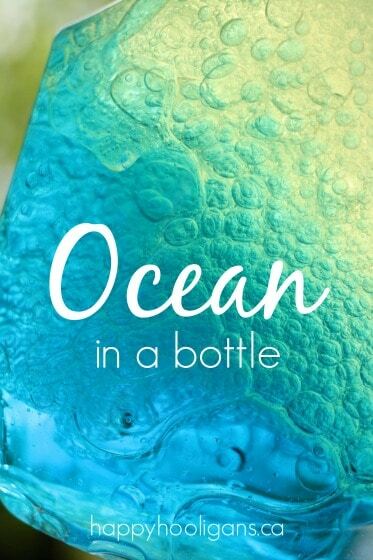 What a cute and simple activity. I’m definitely pinning for future use. Thank you so much for sharing! What a cool craft! Easy for me too! Lol. Thank you so much, Julie! I’m glad you enjoyed our chimes. This craft was one of my favourites from this past year. Whenever I see these (which is often because they are all over Pinterest!) I am in love! So so so so so gorgeous! 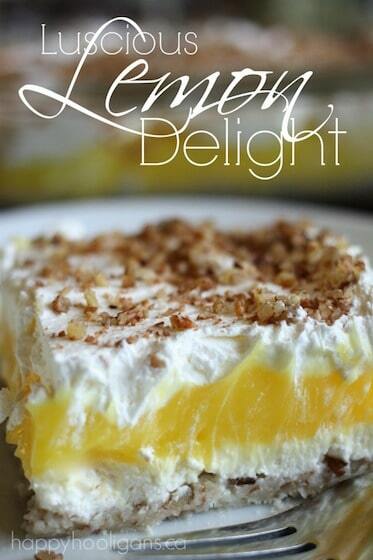 Thank you so much for linking up one of my favorite posts to last week’s Discover & Explore! 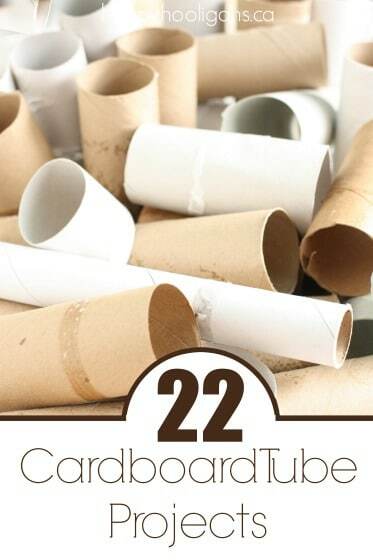 We’re doing this tomorrow…made TP roll chicks today and TP roll bunnies last week. My grandson (and I) love doing crafts!! Yours are the best!! 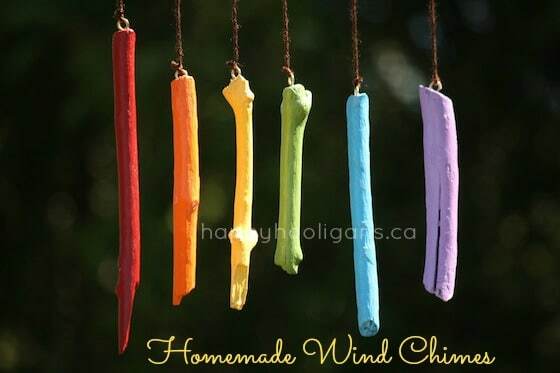 So delightful to hang this colourful wind home on a tree outdoors. Will be going on a Nature Hunt with the cherubs soon. I just love how simple and creative you can be! I am a little slow in starting this project, but now that my granddaughter is out of school for the summer, I have to find something interesting for her to be involve with. She is limited in what she can do and I thought this would be a fun thing (even if I do most of it. She will enjoy the final outcome of this project for sure. Thank you for all of your great ideas. You’re so welcome, Marilyn! You’ll both enjoy this one. I did have to help with the hooks, and strings, but the kids had a great time peeling the bark off the sticks, sanding them and painting them. Some of the older ones were able to twist the hooks in (great fine-motor building there) once I’d started them for them. 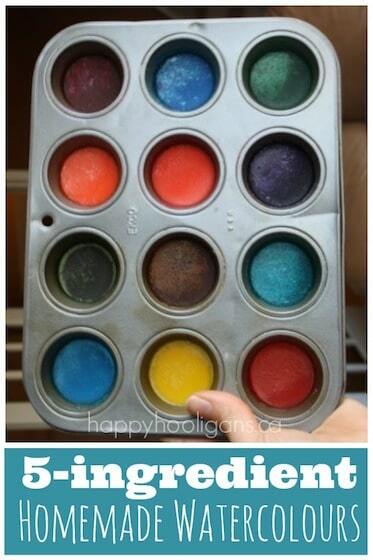 Thanks for sharing – A nice & easy fun activity, with so much learning opportunities. Looking forward to giving it a try. Glad you like it, Pauline! Just made these with my three year old. We had lots of fun with the process and love the finished product! Thanks for the idea! You’re welcome, Janessa! I’m so glad you guys had fun making your chimes! This was one of my all-time favourite projects!